EJOLTs’ coordinator – Joan Martinez Alier – was a keynote speaker in the recently held third international degrowth conference, in Venice. He spoke about the links between degrowth and environmental justice after a screening of the EJOLT movie Yasuni ITT: El Buen Vivir. The blog post below is an excellent wrap-up made by Inter Press Service (IPS). VENICE – “We should find the way, with our small degrowth movement in the global North, to align ourselves with the environmental justice movement originating with indigenous peoples from the South,” Catalan ecological economist Juan Martinez-Alier said at the third international degrowth conference in Venice, Italy. Degrowth is a popular concept particularly in France, Italy and Spain, and is slowly gathering fans in other parts of Europe and North America. It argues that a democratic collective decision to consume and produce less in the global North is the most appropriate solution for the multiple crises facing the world today. Renouncing economic growth in the North, say the proponents, would not only allow humanity to stay within the ecological limits of the planet but also contribute to restoring global social justice. In practice, degrowth is compatible with grassroots projects such as food cooperatives, urban gardening, local currencies, co-housing projects, waste reduction and reuse initiatives, or the ‘transition towns’ idea originating in the UK. It allows for cooperation with local, regional and even national authorities, albeit not heavily relying on governmental measures, and it is anti-corporate. Proponents of de-growth champion the concept of “buen vivir”, a vision of life in which the well-being of human and the rest of the natural world are considered as interrelated and pursued at the same time. The third international degrowth conference that took place Sep. 19-23 in Venice in Italy brought together about 600 activists and intellectuals to discuss issues as varied as food sovereignty, the energy transition, a minimum guaranteed income, the debt crisis, and participative politics. Among these, one of the most visible themes this year has been the increased attention paid to solutions to the global crises stemming from the global South and their compatibility with the degrowth vision. Martinez-Alier was speaking about the need for convergence between degrowth and environmental justice movements in the global South following a showing of the movie Yasuni ITT: El Buen Vivir which depicts struggles around the exploration of oil resources in the Yasuni biosphere in the Ecuadorian Amazon, threatening the lifestyles and even lives of indigenous peoples there, the Kichwas and the Waoranis. According to the ecological economist, degrowth activists working towards radically reducing consumption in the global North should align their struggle with that of social movements fighting against extractive projects in Latin America: for one, reducing consumption in the North would diminish demand for those natural resources mined for in the Amazon and other pristine natural areas; for another, indigenous victories to preserve homelands intact also mean less pollution from mining and big infrastructure projects and less of a push in the direction of disastrous climate change. Escobar explained that the most promising directions of change in the South are coming from some social movements in Latin America, primarily indigenous, black and peasant movements. Secondly, most countries in the region (Venezuela, Bolivia, Argentina, Brazil, Chile under former president Michelle Bachelet, Paraguay under former president Fernando Lugo, Uruguay) experience what is seen as an “enlightened development model” of leftist regimes which continue to pursue pro-growth traditional development agendas but pay special attention to tackling poverty and inequality and even succeed in these tasks. Nevertheless, the traditional development approach translates into the intensive exploitation of natural resources in order to generate income, with negative consequences on nature and indigenous populations living there as well as on climate. The third Latin American change project, in Escobar’s classification, stems from social movements critical of extractivism as a strategy to address social injustice, and is closely associated with the Andean indigenous concept of “buen vivir”, a vision of life in which the well-being of human and the rest of the natural world are considered as interrelated and pursued at the same time. Escobar refers to this third project of change as decolonial, post-liberal or transitional. The concept of buen vivir has been incorporated in the Ecuadorian constitution in 2008, but critics of the Ecuadorian government argue that the continued pursuit of some extractive projects in this country runs counter to this vision. According to Arturo Escobar, a solid dialogue between degrowth proponents in the North and post-extractivist social movements and intellectuals in the global South is a good way to begin addressing the global crises as long as we are aware that the answers will not be universal or immediate. “But what degrowth proponents (who reject economic growth) must be aware of,” Escobar told IPS, “is that development is much more than growth. So it might be that the global South needs some growth, in areas such as health, education, employment, decent standards of living, if this is subordinated to the principle of buen vivir and not under the currently predominant vision of development. 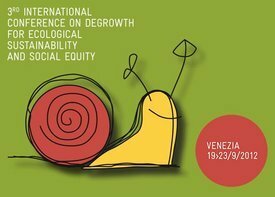 I would like to get pdf of proceedings of third international degrowth conference held in Venice in 2012.